This auction was won by p***n.
Enjoy a 2 night stay for 2 guests in a Snow Mountain View Suite at the beautiful Banyan Tree Lijiang in the Gucheng District of Lijiang, P. R. China. Stay includes: daily breakfast, return airport transfers from Lijiang Sanyi Airport and welcome drinks for 2. Stay is valued at approximately $588 USD / £460 GBP*. Please note all additional purchases including meals, drinks, spa treatments, excursions etc. must be paid for by the winner separately. Auction stay dates: to be booked in advance and taken between 02 January to 30 December 2019, excluding bookings over all Chinese Public holidays and between 15 July to 15 Aug 2019, subject to availability. The Banyan Tree Lijiang lies at the foot of the Jade Dragon Snow Mountain, inviting guests for an adventure back in time, to the ancient city of Lijiang. With charming cobblestone streets and beautiful canals running through the town, this UNESCO World Heritage Site is a true marvel. Enjoy old architecture and a sense of walking through history in what was the fascinating old Naxi Kingdom. This luxury highland resort lies 2,400 metres above sea level and offers breath taking views of the Jade Dragon Snow Mountain. Guests can uncover the beauty of Lijiang on foot, bicycle or horseback, and visit charming sights, including Tiger Leaping Gorge, take a trip around the old town and pick up historical artefacts to bring home. The hotel boasts BanyanTree SPA, fitness centre, library, BanyanTre Gallery, Kids Club, bicycle rental, in room dining as well as a hiking trail, outdoor tennis court and meeting room. In terms of dining, the Banyan Tree take food seriously. It features two restaurants offering the best of Chinese dining as well as destination dining experiences including a gourmet meal in a pagoda under the moonlight! The charming Wen Hai Cocktail Bar also offers light bites and afternoon teas. Guests stay in charming villas with authentic Naxi inspired architecture, close to Shuhe Old Town and Baisha Village, enjoying the fresh mountain air. The winner and their guest will be staying in a 99sqm. Snow Mountain View Suite with private balcony. 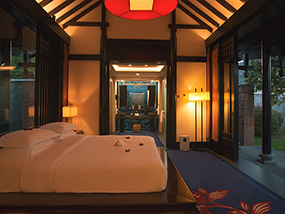 The suite comes with a private living area, and architecture reflecting the romance of Naxi culture. Other amenities include: a king size bed with pillow menu, daybed to lounge on and enjoy the view, bathrobes, slippers, bathroom amenities, TV with international channels, CD and DVD Player, coffee and tea making facilities and safe. Luxury Travel Diary terms and conditions apply. *This auction item is valued at approximately $588 USD by Banyan Tree Lijiang, Yuerong Road, Shuhe, Gucheng District, Lijiang, P. R. China 674100 – please note this valuation is the list price provided to Luxury Travel Diary by the Auction Prize Provider and should be used as a guide only as cheaper discounted rates may be available. No cash alternative is available. This auction item excludes flights and transport – you will need to arrange your own flights / transportation to and from your home to Banyan Tree Lijiang, Yuerong Road, Shuhe, Gucheng District, Lijiang, P. R. China 674100 to coincide with your booking. Your stay is subject to availability, must be booked in advance and taken between 02 January to 30 December 2019, excluding bookings over all Chinese Public holidays and between 15 July to 15 Aug 2019. Please note any associated taxes / resort fees / entrance fees etc. and all additional purchases will be collected from the winner by the relevant property at the time of booking your stay or on departure and will not be deducted from the amount bid for the item. Winners must pay for their auction item in full via PayPal within 48 hours of the auction end. The full Terms of our auctions can be found here. To the fullest extent permitted by law, Luxury Travel Diary will not be liable for any loss or damage arising out of the winners’ use or enjoyment of the prize; and the winner acknowledges that Luxury Travel Diary accepts no responsibility whether directly or indirectly for any claims whatsoever arising in respect of the prizes provided by third party providers or sponsors.